The external force F greater than 10.4 Newton. 2. Mass of a block = 2 kg, coefficient of static friction µs = 0.4 and θ = 45o. 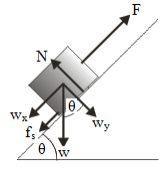 Determine the magnitude of the force F so the block start to slides up. Block starts to slide up, if F ≥ wx + fs.